Bangladesh’s tryst with democracy began a new chapter in the nation’s history when the newly independent nation adopted its first Constitution in 1972 with the tenets of nationalism, democracy, socialism and secularism. The then political environment of the country was possibly not conducive to these principles of democracy as it had just witnessed the vicissitudes of political assassinations followed by an extended period of ‘junta rule’ that lasted for nearly two decades. 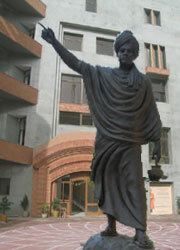 Nevertheless, the aspiration for democracy encouraged Bangladesh to reinstate a Parliamentary form of democracy in 1991. Bangladesh thereafter, witnessed an epidemic of political violence in form of hartals, boycotts and politics of intransigence. Conflicting issues were taken straight to the streets and elsewhere within the country instead of the Parliament. Vengeance and violence have, since then, very much remained the core characteristics of Bangladeshi politics. The aim of the present study is to analyze the genesis of the ‘politics of conflict’ arising out of the deteriorating relationship between the two principal political parties namely the Awami League (AL) and the Bangladesh Nationalist Party (BNP). The role of hartals, politics of repression, escalating political confrontation, frequent boycott of national Parliament and serious challenges of Law & Order, have left political observers wondering if there was any solution to the present state of crisis that the country is currently witnessing. The genesis of the deep-rooted ideological conflict between Awami League and Bangladesh Nationalist Party can well be traced back to the divisive policies pursued by the British when they were contemplating the division of the Indian sub-continent. Initially named Awami Muslim League, it was renamed as Awami League in 1955 after the routing of the Muslim League in the then East Pakistan general elections of 1954. This symbolized the rejection of non-secular and unitary ideology of the Muslim League by the people. The people of then East Pakistan had given early indication of their preference for secularism and freedom of religion. To an extent this tussle between two warring ideologies significantly contributed to the eventual emergence of the Awami League and the Bangladesh Nationalist Party as the two principal political entities in the country. Pakistan too stirred up the clash between the regional identity and the religious identity. Bengali identity was deeply embedded in the cultural ethos of Bangladesh whereas the concept of religious identity was the game - plan of the Pakistani elite and the ‘Islam-pasand’ parties and their supporters. The Punjabis and Urdu speaking majority from UP and Bihar dominated the partition politics primarily after 1947. To accentuate their identity they purposely pursued policies which ended up in exploitation of the resources of East Pakistan. As a result, Bangladesh became effectively a prisoner of transition from ‘one colonial rule to another’. Systemic economic discrimination contributed significantly to the early consciousness of a separate and secular identity in then East Pakistan. Further on, Jinnah’s Declaration in Dhaka of Urdu being the only state language of Pakistan made the matters worse for the regionally active Bengalis of East Pakistan. It was in this background that Awami League under the towering leadership of Sheikh Mujibur-Rahman became the only probable platform for upholding the national aspirations of the Bengalis of the East Pakistan1. The 6-point programme that began in 1966, culminated into a mass people’s movement by 1969. This was not welcomed by the dictator Yahya Khan and his coterie. Even though with the birth of Bangladesh, the ideology of secular nationalism triumphed over the fanatic ‘Islam pasand’ parties backed by Pakistan, Islamic resurgence as witnessed today in Bangladesh was never given up as a long term systemic planning of all the fanatic parties of West Pakistan and also the Pakistan army which could not come to terms with the creation of a separate nation founded on secularism and Bengali nationalism. The developments in Bangladesh post its creation, presented an ideal ground where the Islamist parties could work craftily to spread the growth of ‘Islam pasand’ ideology. Moreover, the lackadaisical attitude of the natives that their nation was presumably immune to all Islamist militancy made the matter worse. They failed to check the growing menace of Islamic orthodoxy which aimed at destroying the fabric of their flourishing democracy. Post 1973, the Marxist Leninist Communist movements also began posing threats to the Awami League government. To make matters worse, the alliance between non-Bengali residents of East Pakistan and members of Jama’at (Jama’at-i-Islami of Pakistan) took away the secular sheen, the country once proudly possessed. Thereafter, within a short duration, two revolutions took place, wherein the parliamentary democracy was immediately replaced by a presidential one. With the result, the middle class and the urban elite now stood completely alienated. The military coup that overthrew the 1st elected government set the foundation for military and quasi-military rule and take-overs in the country where the principles of freedom of speech, secular thoughts and righteous democracy had once prevailed. The very visible shift in the scheme of things became evident post Mujib’s assassination in 1975. The period 1975 to 1990 of military and quasi-military rule, first by Gen. Ziaur Rahman (1975-1981) and then by Gen. Hussain Mohd. Ershad (1982-1990), set the tradition of military rules in the country. Gen. Ziaur Rahman consolidated his position within the army after wiping out the radical left elements, with whose support he reached where he was, and began his anti- India and anti-left campaign. Gen. Ziaur Rahman formed his own political party that saw the birth of the Bangladesh Nationalist Party. Fundamental changes were immediately brought into the Constitution. Secularism was dropped and socialism was redefined. Islamic Preamble that acknowledged the primacy of Islam was added thereby automatically emphasizing the Muslim identity over the cultural identity. Now, the identity of nationals as ‘Bangladeshis’ rather than ‘Bengalis’ which was favoured earlier by the Awami League, was being encouraged in the country. A war footing effort was also launched by the newly formed BNP & other Islamist parties to negate the role of the Awami League during the war of Liberation. Jama’at and other Islamist parties gained a very significant role during Zia’s reign. It was now allowed to function officially in Bangladesh. The period from 1982-1990 was marked with another military take over by Ershad and an increased role for Islam in the culture and politics of Bangladesh. In order to forcibly end corruption, reorganize the government and thereby achieve political and economic stability, General Ershad seized control of the government in a military coup in March 1982. There was hardly any resistance to Ershad’s take over as all the major political forces in the country failed to unite. From 1982-1985, Ershad, like Zia, installed a civilian President in Abul Fazal Mohammod Ahsanauddin Chowdhary. But soon in December 1983, Ershad himself assumed Presidency. His Jatiyo Party was composed of various elements from leftist and rightist political parties in order to extend the support-base of his regime. The Parliamentary election held in 1986 under Martial law gave the Jatiyo Party single largest majority in the third Parliament. Ershad permitted the rise of other splinter Islamic parties to counter the growth of the Jama’at. Islamic agenda was primary but very much under the control of Army. However, rising level of mass demonstrations in the country forced Ershad to dissolve the third Parliament and call for another Parliamentary election in 1987. The highlight of the Gen. Ershad’s rule was the declaration of Islam as the state religion. Another prominent development was the increase in the number of seats reserved for women to 30, to be indirectly elected by the Parliament for another 10 years. The tenth Amendment to the constitution ensured this2. The growing demand for restoration of democracy forced Ershad to resign in 1990, handing over power to Chief Justice Shahabuddin Ahmed. Perhaps the only notable difference from the previous regime was that, Gen. Ershad, permitted the return of the Awami League. With the passage of time, the Awami League again became an integral part of Bangladesh’s societal political structure just like the Bangladesh Nationalist Party. The BNP occupies centre-right position in the political spectrum of the country and remains deeply committed to conservatism, nationalism and anti-communism. In short, it seeks to represent the ‘Islamic conscience’ of Bangladesh3. The Awami League, on the hand, is the country’s centre-left party whose ideology stems from its commitment to secularism and its staunch belief in Bengali nationalism. Venom between the two is also rooted in the power struggle between the key leaders of the respective parties who are always striving for dominance in the country. Enmity between them has primarily revolved around the ideological fault lines, questions of secularism, Bengali nationalism and the role of Islam. The history of the War of Liberation also remains a fundamental source of disagreement between them. The conflict resolves around the commendation and criticism of the role played by the party leaders during the War of Liberation. The recognition of secularism as a key tenet by the Constitution under the Awami League government is yet another major issue dividing the two parties and the intelligentsia. Bangladesh Nationalist Party’s perception of this recognition as anti-Islamic led to further bloodshed and violence. The political chaos, manifested regularly through violence between the two parties, opened the doors for the political ‘Islam pasand’ parties and their groups in Bangladesh to re-emerge as a force on the politico-social spectrum. In any democracy, competing parties cannot be expected to subscribe to similar ideologies. Healthy differences strengthen a democracy. But ironically, in Bangladesh, it has had the opposite effect leading to violent confrontation, thereby diminishing the possibility of discussion and cooperation. Mud-slinging politics between the two major parties has created a lot of bad blood. While this was happening over virtually the entire period of restoration of democratic process in Bangladesh with the AL and BNP in turn resorting to the politics of bundhs and hartals, since 2013, its intensity and frequency has assumed crippling proportions. During the elections, activists of the BNP and the Islamist Jama’at-e-Islami (JI) resorted to massive violence, including the torching of dozens of polling stations and other anti-social activities. A very similar deadlock had also taken place in 2006, prior to Parliamentary elections, which ultimately led to a quasi-military lasting for over two years before the next elections took place. BNP leader Khaleda Zia bitterly opposed the handling and conduct of the 2013 elections. The system of caretaker government overseeing the elections since 1991 was earlier abolished by the AL government in 2011, further aggravating the politics of conflict in the country. `The decision of the AL government to constitute War Crime Tribunals in 2009 to put to trail all those involved in war crimes during the War of Liberation has been another major factor in escalating tension between the pro-liberation and the anti-liberation forces. In 2013, the Tribunal handed down guilty verdicts against nine individuals which included six death and three life sentences as punishments. The top ideologues from the main ‘Islam pasand’ party, the Jama’at-i-Islami (as well as two from the BNP) were held guilty. Thereafter, began a major tussle between the Human Rights Organization, which regarded the trials being full of legal flaws and the urban educated people who held the view that all those who were held guilty must be severely punished. The most evident example of such political divide was the conversion of QuaderMollah’s sentence from life imprisonment to death. The announcement of the initial sentence was met with severe protests from the pro-liberation forces which culminated in the formation of the Shahbagh Movement in 2013. The protestors included bloggers, young activists and other secular forces of the country. This forced the government to amend the act on which the war crime trials were based so as to allow the convicts and the prosecution the right to appeal4. Despite its serious legal flaws, 74% of the citizens of Bangladesh continued to support the war crime trials. By the end of 2013, the Shahbagh activists demanded that the Jama’at-i-Islami should be completely out-lawed since it was non-secular and militant in nature. QuaderMollah’s death verdict further accelerated the conflict and seething tension followed by further riots and blood-shed. Not surprisingly, ‘Hefazat-e-Islam’, a well-known Islamist movement countered the protest of Shahbagh square. The conflict surrounding the war crime trials reflects intensely whether or not the parties which adhere to political Islam should be allowed a place in the political system of Bangladesh. Though the Election Commission had in 2013 cancelled the JI’s registration as a political party on the ground of it being non-secular in nature, the party still exists and is actively involved in politics. BNP’s belief in the role of Islam in unifying the nation is out rightly rejected by the Awami League. Nevertheless, there are signs of compromise. PM Sheikh Hasina has signaled her readiness to re-engage in dialogues with the opposition but only under certain conditions. Sheikh Hasina has asked the BNP to sever its ties with the JI and other Islamist groups as a pre-condition to talks. BNP in response has reduced its call for ‘bandhs’ and blockades. However, the major contention between the two is yet to be resolved. This relates to the role of the Jama’at in the politics of Bangladesh. The political scenario in Bangladesh is such that it can neither be a totally fundamentalist Islamic State nor a highly secular state. The demonstrations at Shahbagh Square which could not be quashed either by fundamentalist or by liberals justify the above statement5. The protests manifested the lack of trust which the urban educated middle-class harbours towards the political parties and the democratic institutions. The Shahbagh protestors and their supporters were deeply concerned over the commuting of a death penalty of a convict to life imprisonment. There was zeal among the young to accelerate the proceedings of punishment of the war criminals of 1971. Peaceful protests, strikes and hartals are acknowledged as valid tools of dissent in democracy and legitimate means of opposing government policies. But the key word here is ‘peaceful’. Equally critical is the fact that having registered the protest, the contending political entities, be it the AL or the BNP, must ultimately engage politically in finding peaceful resolution. This has been missing in Bangladesh. The deep mistrust and the visible unwillingness of the political leaders of the countries main political parties to work together for peaceful resolution is the most distressing aspect of the politics of conflict in Bangladesh. The distance between being in power and not being in power has aggravated the culture of hartals, bandhs and blockades in the country. Protests again intensified in recent months after the Bangladesh Nationalist Party decided to launch protests on the first anniversary of the 2014 Parliamentary elections as illegal. In the face of long periods of hartals, bundhs accompanied by violence disruptions and deaths, not only the people of Bangladesh have suffered immense inconvenience, suffered economic losses but the country as a whole has been inflicted huge national loss. Production in factories and business institutions has declined and workers are being retrenched; agriculture and transport sectors have been adversely impacted. Every hartal is followed by ghastly sights of property destruction and vandalism. Political parties have encouraged hartals to proclaim public support but the impact is quite the opposite. People have started losing faith in the political system and the political leaders themselves. As a consequence, in the changing scenario, people are now favouring other methods of showing protests against the government than what the BNP has been following. Opposition’s resorting to peaceful processions and other methods have been welcomed and appreciated by the people. “There is no alternative way of democratic programmes to secure the political demands. Citizens expect the success of peaceful political programme”. (Daily Samkal. Edt., October 10, 2011). In recent times, to ensure order and smooth functioning of the government, political parties have to work out an alternative way of protest and demonstrations where the grievance are heard and the peace of society is unharmed. It is also debatable whether there is any relationship between a hartal and good politics? No there isn’t as the economy and the social fabric of a democratic society are being torn to pieces. Hartals are being rightly dubbed as ‘economic suicides’ for the nation. What is surprising is that in spite of frequent and extended hartals the Bangladesh economy and its social indices have turned in fairly good results. According to the World Bank, Bangladesh has maintained an impressive track-record on growth and development. The World Bank maintains that poverty has dropped, life expectancy has improved, and literacy and per capita food intake too have registered growth. According to the World Bank for Bangladesh to become a middle-income economy, the country will require macro-economic stability, strengthening revenue mobilization, better economic governance and urban management. But these can only be possible through peace in the region and stable political environment6. The Asian Development Bank has also categorically stated that in the past decade, the Bangladeshi economy has grown at nearly 6 per cent. Brisk exports have also so far helped the nation to maintain growth and a current surplus in the fiscal year 2014, despite the severe political disturbances ahead of elections in January, 20147. However, in the medium and long term, the continuing blockades in 2015 will certainly constrain growth and turn the current account into a small deficit. However, higher growth and a current account surplus are projected to make a comeback in financial year 2016. Gross Domestic Product growth in financial year is projected at 6.1%. Bangladesh might have yielded better results had it not been for the unending saga of hartals and blockades which manifests itself deeply in this politics of intransigence. In addition to the traditional inter-party conflict and the prevailing atmosphere of lawlessness Bangladesh has recently started witnessing a new kind of politico-religious motivated violence through recurring incidents of bomb-blasts. Islamic radicals have adopted this method to pursue their own agenda and aspirations of establishing shariah and to eradicate all that is anti-Islamic. The kind of violence being perpetrated by the radical Islamist groups can be an issue of separate study since it is, in a way linked to what is happening generally in the Islamic world. Very briefly, the Al-Qaeda and the Islamic State (IS or ISIS) have targeted the Asian sub-continent in a major way and Bangladesh is fast emerging as a fertile hunting ground by both. The two have set up their own modules largely active in the fields of indoctrination of youth and their recruitment for participation in the West Asian battlegrounds. Bangladesh needs to deal with this threat as a nation and as a society irrespective of internal political dynamics. Coming back to the issue of politically motivated incidents of bomb blasts and street violence, these are being largely carried out against random targets by BNP and Jama’at cadres to spread terror in the society. ‘State repression’ as alleged by the opposition, is another means through which political violence is being institutionalized. The ruling party allegedly undertakes repressive measures to counter the opposition through legal or police repression. This practice of repression is deeply entrenched in the Bangladeshi political system. It is cyclical in nature where the party in power adopts repressive measures on the other in opposition. As a result, the opposition uncompromisingly voices their demands to release their leaders and activists as a pre-condition for any dialogues. Government seldom agrees to such demands, which often lead to further violence8. Extortion and murder creates further rifts between the political parties. Confrontation has also been visible in the form of street violence and agitation, which has been used as a supportive political tool by nearly all the major parties of the country. Perhaps the only visible difference between the AL and the BNP regarding their use of agitation is that of degree and time. The former unleashes them selectively and is also less organized than its rival BNP and the Jama’at. To end such a malpractice, all the political parties and the government will have to check and use restraints on their activities. It must be borne in mind that most of the victims to such agitations are usually ordinary citizens without having any involvement in politics. The parties have to realize that the political void which is created by the unwillingness of these two mainstream parties in exploited by the extremists, criminals and fanatics who ruin the very fabric of democracy which the country proudly possess. Both the parties would perhaps be served best by the changing order where they will have to mutually respect the democratic right to dissent. Further on, the BNP’s marginalization from mainstream politics could also encourage anti-government activities and find subsequently radical avenues to be heard by the government. BNP should also rethink its alliance of convenience with the other Islam pasand parties. The government, on the other hand should reverse measures that tend to curb the civil liberties of the people. Both the parties have to thus commit to non-repressive response to political dissent and have to realize that violence leads to political instability. Reconciliation has to find a room especially when the political fault lines are becoming more entrenched. Boycott of the national Parliament is yet another manifestation of intransigence by the opposition parties in Bangladesh. During the 5th, 7th, 8th and 9th Parliaments, the opposition which is an indispensable component in a democracy, missed 34%, 43%, 60% and 83.38% number of working days in a Parliamentary session by boycotting it9. Though very popular in the history of democracy, this practice of boycotting the parliament has emerged as a major challenge to the very essence of democracy, particularly in our part of the world in the present times. A parliament, in the absence of a healthy opposition can neither deliver the fruits of democracy to the people who elect their representatives with great enthusiasm and accompanying hope, nor do these in any manner strengthen the very system that they claim to belong to. The very innovative idea of a care-taker government (CTG) as a home-grown solution to political confrontation has been proved futile. Since the country has now moved away from a caretaker government system, the Election Commission is now required to hold free and fair parliamentary and local elections in future. This would require a competent Election Commission that enjoys the confidence of all political parties and is fully and truly independent in its functioning. The recently held Mayoral elections in Bangladesh, has highlighted the need to strengthen the democratic institutions such as the Election Commission. Both, the ruling party and the opposition should work together to seek the desired goal. The restoration of CTG should be refrained from, since it can be misused if the ruling party so desires. There should be a fixed term of Parliament in order to avoid friction and prevent growth of disruptive politics. The change to fixed tenure concept will make the system stable by obliterating the demand of mid-term elections.It may be pointed out here that in Sri Lanka the President can call for mid-term elections only after completion of four and a half years of its five year tenure. Another contentious issue is the role of speaker of the Parliament. The neutrality of speaker is required when he is holding the post in the Parliament. The party leader’s authority should not be so overwhelming that people within the party having diverse opinion find it difficult to express their views or else be thrown out of the party. There is need to usher in real internal democracy in the political system. All political parties should refrain from having their own or supporting armed political cadre in educational institutions. Above all, good governance is the prime-requisite of a democratic system in the classical formulation of ‘govt. of the people, by the people and for the people’. But in Bangladesh these lofty ideals are dogged by the counter problems and conflicts and confrontations. This has led to monopolization of the state institutions by the party in power. Democracy in Bangladesh is once again at the crossroads. The country has generated conditions for good economic development in the past but to achieve its goal of ‘emerging as a middle level economy’ what is required is faster economic growth which can be achieved only through consolidation of the democratic principles in an atmosphere of peace and stability and a polity free of conflict and confrontation. Continued boycott by the main opposition and reliance on mob-mobilization has created an atmosphere of uncertainty about the nation’s democratic future. The nation requires a change in the thought process of governance and the active involvement of the educated urban minds in bringing about the required systemic changes. Mere periodic and cyclic transfer of power from one party to another will not bring in the aspired change. There has to be no betrayal of secular thought process. Mukto Mona (“free mind”) has to be encouraged10. In order to break the political deadlock, the domestic and international actors will have to support a comprehensive political dialogue between the two parties identifying a common ground between the AL and BNP as far as the conduct of war crime trials and the question of granting political and legal space to the ‘Islam pasand parties’ is concerned. At no stage, military invention or the negative role of religion could be welcome. Two years of military rule severely damaged the Bangladeshi society and also heightened the conflict between the major political parties. Impartial state institutions at all levels have to be encouraged in order to improve the long term prospects for transparent and democratic governance in Bangladesh. Socio-economic and political development of the nation should take the desired precedence before the warring minds of the ‘Two Begums’. Politics of conflict and confrontation must end and give way to one of amity and cooperation. Amb. Tariq Karim : Quo Vadis, Bangladesh? Regional Cooperation & Globalization Bangladesh, South Asia and beyond. Rounaq Jahan Inge Amundsen –CPD-CMI WORKING PAPER SERIES.The Parliament of Bangladesh – Representation and Accountability. Riashad Azim : The Politics of Intransigence and the Erosion of Democracy. Jasmin Lorch : Elections in Bangladesh : Political Conflict and Problems of Credibility. The World Bank/working for a World Free of Poverty – Bangladesh. Asian Development Bank : Bangladesh Economy. CPD-CMI Work Paper-2, TIB’s Parliament Evaluation Report. Mukto Mona : Blog founded by the slain blogger Avijit Roy.